The infinite working positions it offers, makes the machine operator work in a secure and ergonomic position. This reduces remarkably the working time and avoids depending on auxiliary elevation elements. Designed for a highly steady behavior and put together by highly resistant structural profiles that allow the execution of elevation, inclination and rotation of big workpieces and weights in secure conditions. It permits the continuous and the bidirectional rotation of the workpiece that is being handled. The plate is made of high elastic limit sheet metal and has well positioned holes and slots to achieve a secure fixation of the workpiece through rapid attachment accessories. The slew ring acts as a joint element between the lower bed and the workpiece holder plate. 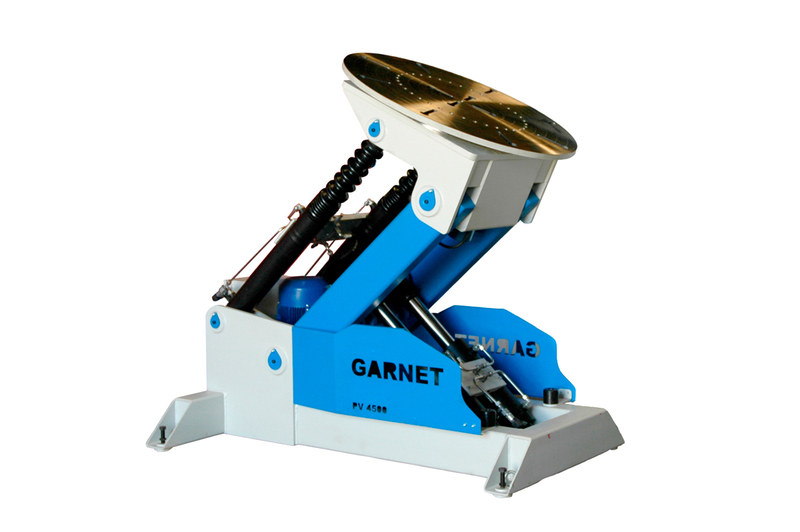 The machine is supplied with a control button bar that permits executing all the maneuvers. The button bar disposes of a regulator such as a potentiometer to easily control the speed of the plate rotation. Oleo-dynamic mechanism that works at a constant speed. The infinite combinations of both movements permit operate in an optimal way during the adjustment and welding maneuvers and/or during the assembly in multiple applications. The mechanism disposes of a progressive starting and stopping system. Elevation and inclination speed control. Wireless control system, through radio frequency. Automatic stop system when “not in use”. Personalized and intelligent load attaching system.